Hi friends, a very happy news to all airtel broadband users. Now you can get upto 60gb free high speed data from airtel. 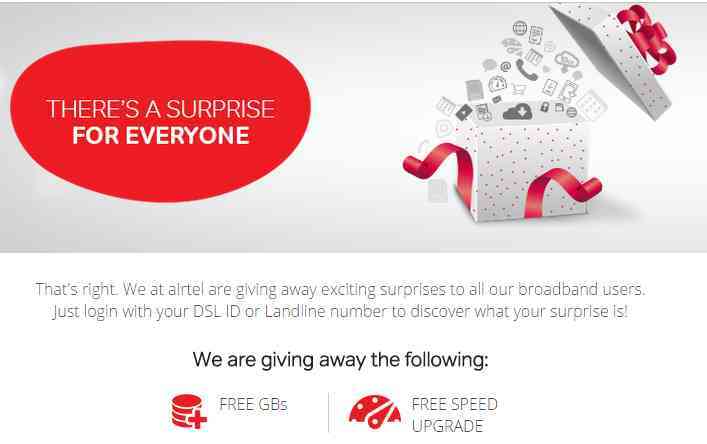 Airtel giving Free Data from 1gb to 60gb free or free high speed upgrade for their airtel broad band users. It is an official offer from airtel. also it is limited time offer, friends grab it before ends. Enjoy high speed free airtel broadband data. Note- This is a limited time offer. Hope you enjoyed reading the article. If you like the article then please share it own social networking sites. Also keep visiting techintor.com for more network trick, loot tricks and all other tech updates.